Okay, so the basic Animator in Unity can be intimidating to someone just learning. A lot of the tutorials for animation in Unity start right into creating transitions between states and using variables to trigger transitions, and sometimes that’s overkill for what you want to do. There is a function for the Animator class, it’s called Animator.Play. It’s often overlooked, (even that script reference I just linked doesn’t describe it) but it’s pretty nice if you want to cut to the chase and don’t want to use anything fancy. I’ve been playing a little with the Fungus engine, which is designed for making visual novels, and have node-based flow control. For the built-in animation commands in Fungus, there are Set Anim Trigger, Set Anim Float, etc. These are all ways to set variables on the animator, and then if you’ve got transitions that activate based on those variables, then the transitions change the state of the animator. So using them requires you set up variables and transitions for whatever you’re doing. So I figure, sometimes you want to cut out the middleman, and just change states directly. So I made my own Fungus command that lets you directly change state. In the Animator, you can just add states by dragging in animations. You don’t need to make any transitions between states. In the Fungus command, the State Name parameter should be the name of the state that appears in that Animator flowchart. I’ve included Layer parameter in the command, though if you do want to keep it simple, just leave it with the default -1 and leave your animator with the default base layer. The time parameter lets you start the animation part-way through the clip, so 0 will play from the beginning, 0.5 will start half-way through, etc. You can download the script for this command here. Also, I did my 16th game jam, with a game called Barger Tim. Jupiter Hadley did a play video. (Along with hundreds of other games from the same jam.) It demonstrates the comment I’ve got from some other people that they tried to grab burgers by standing under the dispenser, and also shows how easy it is to overlook the “hold the throw button to throw harder” mechanic. I so often make game jam games with absolutely no play-testing and this sort of “assume the controls are more obvious than they are” is a mistake I really should have had drilled out of my head by now. If I make changes to this, I’ll try to make those controls more obvious, either by trying alternate control schemes, or by just providing instruction. I’ll also play with the head movement; instead of moving a constant speed, they’ll zip up to a starting line, and zip away from a exit line. I think this will help make losing a life feel better, the delay between “This head is out of range for you to hit” and “This head has actually docked you a life” is kind of bad. I did a Pirate Jammers post-mortem presentation as part of a Winnipeg game-jam event, writing it further solidified my thoughts about the game. Some of the presentation incorporated my thoughts from earlier. I compared the appeal of controlling multiple ships to juggling. And the reason why it wasn’t working well in this case was there isn’t enough brink-of-disaster circumstances for you to pull back from. During the jam, I dropped the outer edge, thinking that because there is an incentive to stay close to the island anyway, and failed to consider how this impacted play. As you can see here, there is punishment for going too far away from the island, it just takes longer to lap the island. But it’s a linear punishment. I’m going to try out bringing back the outer ring of the race track, and making that an area where you will be chased by a sea monster until you return to the safe zone. 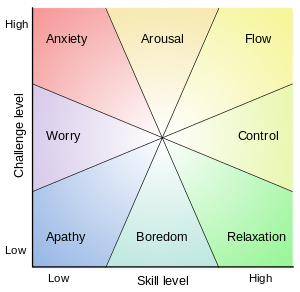 This would return that element of “pulling back from the brink of disaster” that is necessary for that “juggling” feel. During the game jam, I tried out the idea of the ships going in a straight line. During the playtesting of that, unfortunately I was too fixated on the question of whether they should go in a straight line or naturally curve around the island, and neglected other ways I could improve the feel of the game. So I just made Pirate Jammers during a game jam on the weekend. It’s compatible with the Winnitron arcade machine. I’m going to go through the thought process a little bit. First inkling of an idea was roller derby with boats going around an island. And since it’s a two-player game, you’d have to control multiple boats, by switching between them. I had been thinking about roller derby for a while as something to bring into a game, but as a scoring method that would allow for team play. With only two players, and the switching between boats, it would be a different take from what I was thinking, but it’s still the inspiration for it. I briefly considered frogs as an alternate theme, plus then you could have parts of the track on land and parts on water, with different movement in each, but the physics of boats accelerating & decelerating was too enticing. I also had first planned to use a turn-based timer mechanic, like you’d have five seconds to adjust your direction of movement for all four ships, then they’d move for a round, then repeat. I had seen a turn-based cart racer that did something like this. But I decided that real-time worked better for an arcade setting. I got the basic control scheme working pretty quick. I first tried a version where every ship went straight from the direction you last set them. I thought that might have potential to work with the frantic “switching between ships” thing, make you constantly grab whichever ship is getting off course. But it didn’t feel right, so I tried a version where they automatically followed the track, but you could steer them inwards or outwards. That’s basically what the final game uses, with some minor tweaks, like it will gradually straighten back into the path if you leave it alone. Initially because of the basis on roller derby, I started all the ships on the same side of the island, but in practice it gave too much of an advantage to whoever was on the inside track, so I put them on opposite sides of the island to make it more even. Scoring in roller derby is based on the jammer passing an opposing player, and in retrospect this is probably something I should have dropped. I spent a good chunk of time on Saturday trying to get the lapping mechanism working. I succeeded, but this scoring mechanism combined with how the game controls, made it very difficult to score any points at all, especially in the short time they would be playing the game. And if one side pulled ahead, it was incredibly difficult for the player behind to catch up. To address this first problem, I introduced a turtle that randomly pops up and a large tanker ship, to act as obstacles that could throw the game out of a deadlock. The other problem was that players were often confused about how the scoring worked. 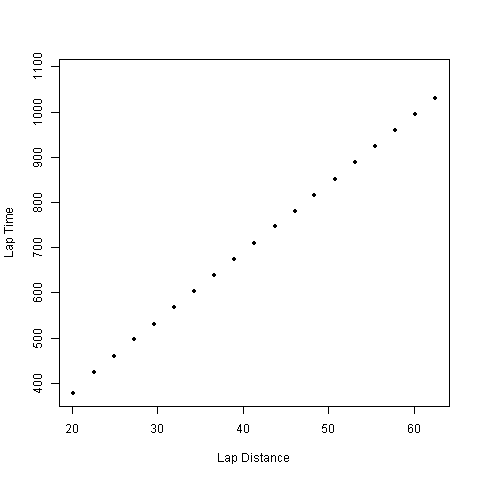 Maybe I should have just dropped that method of scoring entirely and gone with something more basic like count how many laps you’ve done. Shortly after the jam, I started considering what if I just did a version where instead of lapping a single island like this, you were racing down a long path filled with obstacles, and if your ship fell too far behind, it was lost. It might get more mileage out of the frantic-switching element. And actually while writing this, I’m wondering if I should have done more with the outer bounds of the track. Basically, as it is, the penalty for going too far from the island is fairly minor, it just means you’re lapping a little slower than everyone else. If being outside the track meant you were chased by a kraken, or there were many more obstacles out there, then I think that would both help emphasize the frantic ship switching, and would create a new way the player in the lead could accidentally lose the lead. This wouldn’t address the players being confused about scoring, which may be a problem I’m importing from roller derby. This is just a collection of things I found and thought were interesting while playing with the idea of 360 panoramic views in Unity. I’ve implemented something in Unity that works with those videos. Essentially it comes down to putting a sphere around the Unity camera that has UV mapping to match that projection. For some testing I used an image from here. I also tried out the video here. Essentially, the problem is it’s calculating the UV per vertex, but one row of triangles ends up with vertices that wrap from 360 back to 0, so they span the whole texture backwards. I wrote my own UV sphere projecting script, where I looped through each triangle, and if a triangle had one vertex on one far side and two on the other, it would shift the one over. I ended up using this Youtube tutorial as the basis for unwrapping the sphere in Blender. It uses as the applied texture a Mercator-projection map of the world, which would be the same kind of mapping we’re looking for. A good point there is that he marks a vertical seam on the sphere, which fixes the wrapping problem I mentioned. 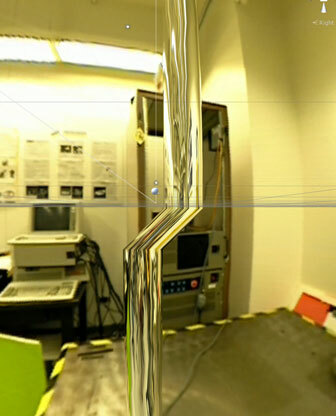 That tutorial was linked from this demonstration of Unity + Oculus Rift + 360 panorama video on Vimeo. The creator of that followed up with his own tutorial. He gets at pretty much what I was doing. He UV maps a sphere, places the viewer in the center and plays the video on it. Exactly how to map the sphere was the crucial part to me. The down-side is these still have some distortion on the two poles of the sphere. This might be inherent to using the equirectangular projection. I think that projection is popular because it still looks but it’s kind of a compromise if you just want something to use in-game. I could just make up any arbitrary projection and use that, but I want a way to produce the video for it, so finding established standards would be preferable. One stitching software for creating panorama video is called Autopano and lists the supported projections here. Hammer projection and “little planet” might be nice alternatives if I want at least one pole not distorted. John Carmack mentioned cube map support for Gear VR. Autopano doesn’t seem to list that as an option, but according to this tutorial, software called Pano2VR includes some cube-based formats. I also used this post as an example to render a panoramic image in Blender, and using that as the sphere texture seems to work out. 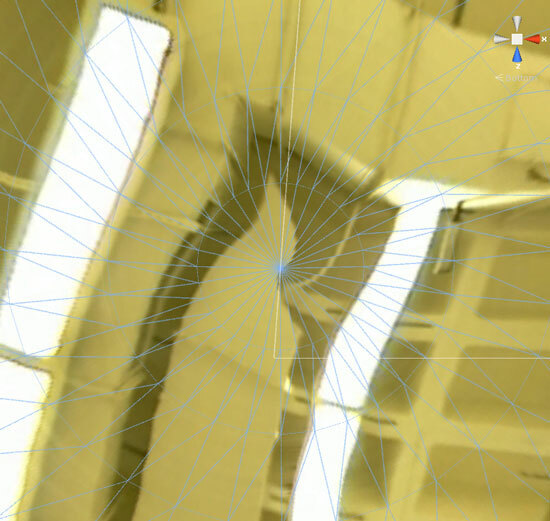 This is slightly on a tangent, but this is a camera on the Unity Asset Store that renders a 360 view from within Unity. You could potentially render that to a texture on the sphere and have a sort of crystal ball. I haven’t tried it yet, but it’s interesting. The creator of Threes shows the email discussion behind the design of the game. To show that even though it’s a very simple game, it can still take a lot of thought to arrive at that configuration. But he’s frustrated that people can then imitate that result for a fraction of the effort. There are so many Five Nights at Freddy’s fan games now. Or look at pool and billiards. There’s English billiards, eight ball, nine ball, snooker, so many variants. And I became fascinated by these old engravings of the early billiards and the idea that it was originally a table-top version of a lawn game like croquet. That summarizes the context for these things. What questions do these lead to? I’m old enough that I remember when a lot of people called First-Person Shooters “Doom Clones.” So I’m wondering, at what point do the imitators of a game turn into a full-fledged genre? I myself have made a Threes-like by trying it out in three dimensions. Though I was more influenced by 2048 than Threes. Does that make it a Threes-like-like? The creator of 2048 said he was copying 1024, so 2048 was itself already a Threes-like-like, and mine would be four generations removed from Threes. If we go back further, Tetris spawned imitators because of its success. Wikipedia of course has a Tile-matching video game article, which attempts to tie together a history of these games. It mentions a contemporary of Tetris called SameGame which could also be an influence on the genre. But this is kind of neat: Columns was a lot like Tetris but introduced match-three instead of filling solid horizontal rows. Later, Tetris Attack come out, using that match-three mechanic, but you no longer control the falling block, you swap adjacent blocks already on the play field. From there, Bejeweled introduces the restriction that you can’t swap any two adjacent blocks, but only allows swaps that result in a new match-three. Plus, instead of the Tetris legacy where you lose when the screen gets filled to the top, in Bejeweled you lose if you have no valid moves. Threes was invented in a world where Bejeweled already existed. Where all the various Tetris imitators already existed. Is it also a slight evolution of what came before, or is it enough of an innovation to say something else is going on here? A Threes game is over when you run out of valid moves, kind of like the Bejeweled standard, but what is a valid move is different. Instead of match three you get match two, but more importantly, instead of scoring as soon as the matching tiles are touching, you only score when you merge them. And after you score, both tiles aren’t removed, rather the two tiles are replaced with one tile, which in turn can be merged with matching tiles. I’m describing these as three changes, but they are kind of interconnected. Bejeweled that let you match-two would be incredibly easy. Threes that required you get three tiles in a row for a merge would be incredibly difficult. The SameGame lineage I mentioned also has the extra stage for a match. (The first variant on that I remember playing is this Ferry Halim game.) But the method of choosing a match is very different. Threes-likes will do all matches in the same direction, while SameGame-likes do matches of the same colour that touch. The progression element feels very important. In Bejeweled you have 7 different colours of tiles to match, but every colour is equal to the others. In Threes, merging a 1 and a 2 makes a 3, merging two 3s makes a 6 and two 6s make a 12, and so on. So the merging mechanic gives all the tile types an order; the higher-numbered tile types are worth more points but are harder to complete. So maybe that’s the biggest change from the Tetris lineage. In Tetris the two progressions were: the score went up if you did well, and the blocks piled higher if you didn’t. Threes creates a progression that naturally gets more difficult without tacking on a speed increase or something like that. None of the whole lineage from Tetris to Bejeweled had that. I find this idea of games with family trees interesting. You see it a lot in folk games as well, where there wasn’t the same tendency to make a game someone’s intellectual property and sell the whole thing as one package. Bowling includes 10 pin, 5 pin, 9-pin, Duckpin, and Candlepin bowling. (I’ve only played the first two, but I shall now endeavour to try the others.) And there is evidence that ancient Romans and Egyptians played similar games. Plus there are some more distantly-related games like bocce. They’re often regional variations. 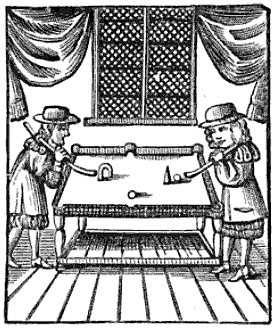 And as I said above, I’m fascinated by the early pool/billiards and the idea of it being a sort of “table croquet” in the same sense as “table tennis.” They used clubs instead of cues, which would make the similarity to lawn games like croquet more obvious. Also, when you look at for example the Nine-ball page on Wikipedia, there are so many slight variants possible with the same equipment by racking different balls or using different rules. But video games tend to exist as a whole package. So you don’t see as much of that sort of thing where the same equipment is re-purposed with some rule changes. There are people who will mod video games, but the technical requirements are higher. (You could make an argument for speed runs, but this post is long enough already.) Even board games like Monopoly, though everything you need is sold in one box, people still regularly play variant rules like the lottery on Free Parking. I can understand why it’s frustrating if you’ve done something significantly innovative like Threes that people come along and imitate it with a fraction of the effort. But from the view of games as folk-games I find it fascinating how quickly Threes got mutated into 2048 and how many people are imitating 2048 without knowing Threes even existed. And is this going to result in a whole new genre of games once the imitators can diversify a little more? Which is I guess why I was considering the innovations of Threes separately. The more you can consider each on its own rather than adopt the whole package, the more your Threes-like can start diversifying that field. So I just realized I hadn’t posted this. Back in November, shortly after Unity and Oculus released the free version of the Oculus SDK, I made a 3D puzzled game called Zed. It’s a Threes-like in three dimensions. The standard approach to VR dev is to do something more immersive, I wanted to try something a little different. Programming was pretty simple, but it was a good exercise in graphic design for three dimensions. The requirements were, I wanted something that would be very difficult to display intuitively on a flat screen, but the controls needed to still be simple. I think there is some potential for games that need to present a large quantity of data but aren’t necessarily immersive. Consider an RTS game. You could have a 3D model of the battlefield, surrounded by a half-dozen display screens of important information. You wouldn’t be able to fit as much onto a computer monitor, and methods of switching screens would not be as intuitive and quick as just turning your head. Or yes, in puzzle games, there might be new types of puzzles that are only possible when viewing them in three dimensions.